Welcome to Lakeview Inn & Suites Slave Lake! Stop in and discover Slave Lake's newest addition to the hospitality industry. 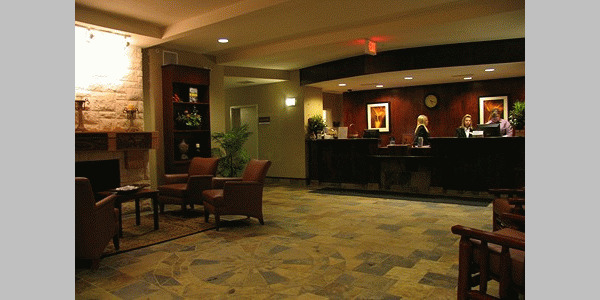 The Lakeview Inn & Suites Slave Lake goes above and beyond to create a warm and inviting atmosphere for you. We offer a wide range of room types to meet any traveler's requirements; such as a room with board table for meetings or a family suite that has a separate children's room equipped with bunk beds. This home appeal carries on into the morning with a free deluxe continental breakfast. Our guests are welcome to relax in our hot tub and use the high end fitness equipment in our exercise room. Our hotel is located just minutes from Slave Lake's downtown area where shopping and restaurants can be found, 15 km from the largest lake in Alberta, Lesser Slave Lake, which has a beautiful beach and picnic area, as well as 10 km South of the beautiful Gilwood Golf & Country Club. These beautifully decorated, spacious guestrooms are available in both smoking and non-smoking. They feature two pillow-top queen beds with luxurious duvets, a 27" flat screen color television, table with two chairs, compact refrigerator and microwave. The bathroom features a lovely granite counter top and eco-friendly toilets. The beautifully decorated family suite has a separate bedroom featuring bunk beds with a double on bottom and single on top. The main area offers a pillow-top king bed, desk and chair and comfy armchair, compact fridge and microwave. Each room has its own flat screen colour television. Both smoking and non-smoking family suites are available. The spacious business class suite features a queen-sized, pillow-top bed with a warm, luxurious duvet, as well as a desk with business chair, compact fridge and microwave and 27" flat screen television in the main area. A separate room offers a boardroom style table with seating for six, a flat-screen, wall-mounted television and a whiteboard. Both smoking and non-smoking suites are available. Perfect for the business traveler! The beautiful and spacious suite features a separate bedroom and living area. The living area includes a hide-a-bed couch, coffee table, desk with business chair and 27" flat screen TV, as well as a kitchen counter with sink, cupboards, microwave and compact fridge. The separate bedroom offers a lovely pillow-top queen-size bed with a warm, cozy duvet and a 27 inch flat screen TV. It's perfect for long-term stays or families. Both smoking and non-smoking suites are available. This beautiful studio-style suite features a working desk with leather office chair, corner Jacuzzi tub, full bathroom, pillow-top queen bed, sofa bed in sitting area and a flat screen 27" television. The suite also features a compact fridge and coffee service with condiments. Both smoking and non-smoking suites are available. Cozy up in front of the fireplace in the beautiful and spacious presidential suite. The main area offers a pillow-top king bed, desk with leather executive chair and corner Jacuzzi tub with presidential bathrobes, a plasma television, compact fridge and coffee service. Please visit Lakeview Inn & Suites - Slave Lake Website.